When I travel, my work usually goes with me. The pleasures and pains of working as a freelancer, I guess. 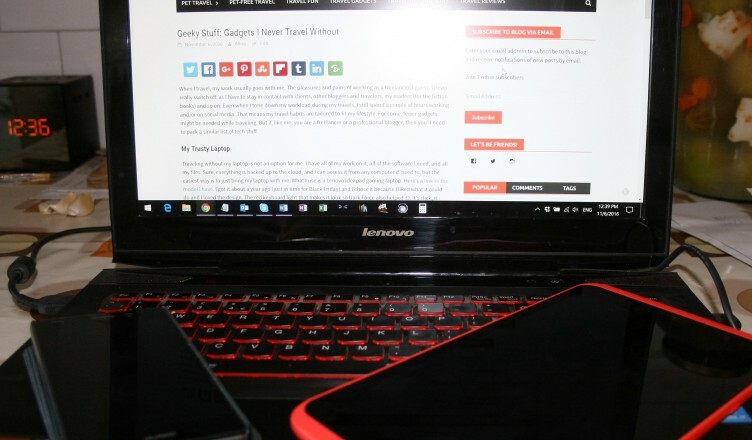 I never really switch off, as I have to stay in contact with clients, other bloggers and travelers, my readers (for the fiction books) and so on. Even when I tone down my workload during my travels, I still spend a couple of hours working and/or on social media. That means my travel habits are tailored to fit my lifestyle. For some, fewer gadgets might be needed while traveling. But if, like me, you are a freelancer or a professional blogger, then you’ll need to pack a similar list of tech stuff. Traveling without my laptop is not an option for me. I have all of my work on it, all of the software I need, and all my files. Sure, everything is backed up to the cloud, and I can access it from any computer if need to, but the easiest way is to just bring my laptop with me. What I use is a Lenovo Ideapad gaming laptop. Here’s a link to the model I have. I got it about a year ago (just in time for Black Friday) and I chose it because I liked what it could do and I loved the design. The red keyboard light that makes it look so Dark Force also helped :D. It’s slick, it does everything I need it to do, and the battery last for a little over two hours, which is more than okay for such a large laptop. Of course, that’s with more than just a MS Office turned on! If i turn the brightness down and only work on a story I am writing, it lasts a bit longer. 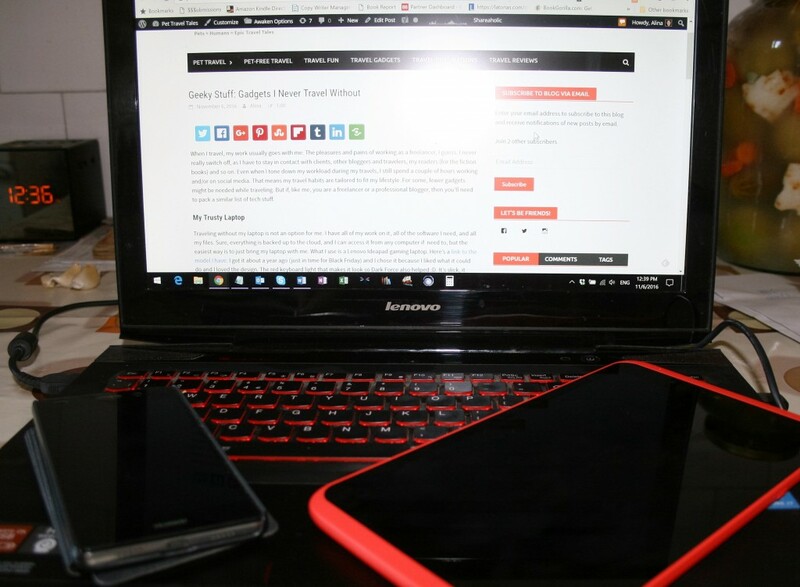 The thing you have to know about me is that I love my gadgets, but I hate having to switch to a new one every year. I am perfectly fine with using the same device for 2-3 years and only switch to a newer model because I have to. I used to be a big Samsung fan, but after my last experience with them, I wasn’t that impressed. My S4 mini started having issues in the first year of usage. Before the two year warranty expired, it had gone into service once and still created the same issues. Overheating and the battery running out in a few hours. I reluctantly bought a new smartphone because I got a good offer from my provider a few months ago. I got a dual sim Huawei model, thinking that investing more in a bigger brand would be pointless. It will start acting out in a year anyway! I had no expectations whatsoever from my P8 Lite dual sim model. And it completely surprised me. The camera is amazingly good for a phone, the device itself works pretty great, the battery is decent, and considering the minimum amount I paid for it, I am extremely happy with it. I’ve been using it a lot to document my trips and to shoot short films (as my DSLR model is pretty old and does not do video). If you want to try my phone, here’s where you can find it. Or, as I’ve heard a lot of people recommending it, you can try the new P9 model. The fact mine is dual sim is great for travel, as you can keep your number and buy a local prepaid card wherever you go. Saves you on roaming costs! If you are traveling in the EU, roaming costs have plummeted and will soon be completely erased. Till then, especially for Internet usage, buying a local sim card is still cheaper. For the longest time, I thought tablets were useless. Why would you need one when you have smartphone and a laptop? And then I realized how amazing they are for a bit of work here and there and especially as ebook readers. I’d always had a kindle, but when I got to try my father’s tablet (to get it ready for him to use), I fell in love. It was easier to answer emails and do social media on a tablet than on the phone. So if I wanted to work a bit before bed, I had the comfort of doing it on a larger screen without taking my laptop out. Did I mention I can’t not read when I am traveling? So the ebook with my Kindle app and my 1-click ebook buying addiction go with me everywhere. I am currently using a Hudl 2. I’ve had it for about a year and a half and totally love it. Unfortunately Tesco is no longer making these tablets. So, when the time comes for me to replace it, I have my eyes on a Kindle Fire. The Kindle tablet I want isn’t shipped to Romania yet, but hopefully they change that policy by the time I am forced to replace my Hudl. I’d like to say I am really good at working my digital SLR camera to its true potential, but I’m not. Fortunately for me, the boyfriend is. And it’s pretty much idiot proof and the automatic settings do a lot for you. I keep saying I’ll focus more on learning to take great pictures, and I have made some minor progress. I like the feel of it and the photos are great. Plus, this Canon 400D has a huge sentimental value. It was a birthday gift from all of my friends and I’ve had it for… 8 or 9 years. A bit fuzzy on the details. As it is so old, I’ve been thinking or replacing it with this newer model, or even a fancier one. I am a huge Canon fan, so I don’t think I am going to change the brand, just the model. Of course, I do also carry a lot of cables and accessories with me. But that’s par for the course and they may vary greatly from one person to another. These are however my basic gadgets and devices. I always pack them when I travel and they help me get the job done, be it work or taking photos to later enjoy during a non-traveling period. 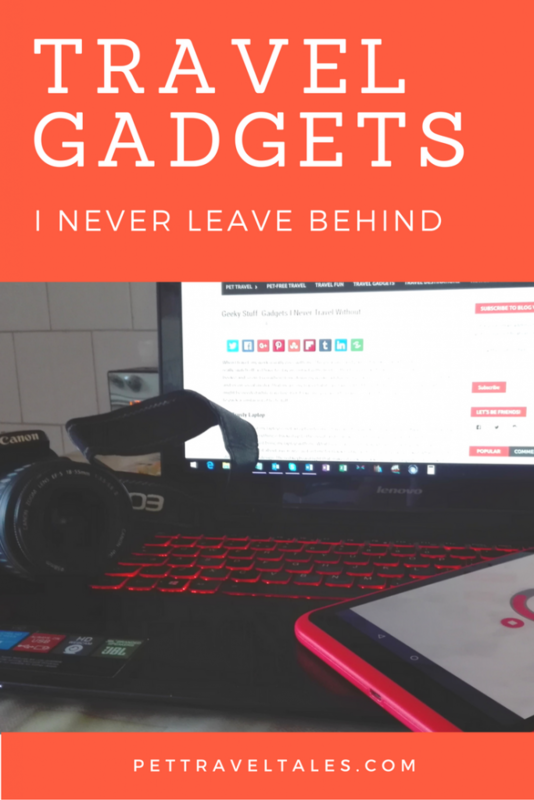 Which gadgets do you travel with? And more importantly, which would you like to travel with? I have a wishlist too, and I will share that in a future post. These are definitely essentials! I have my phone and tablet handy just in case I cannot get my camera out on time to capture moments! I bring my laptop with me as well. I’m a total tech geek. I travel with my laptop (MacBook Pro), Sony A6000 (switched from DSLR to mirrorless in June), a GoPro, iPhone, an EHD, and two external battery chargers. I’ve thought about getting a tablet but still haven’t bitten the bullet. A tablet can be good if you use it as much as I do. I have to do a lot of book reviews as part of my work, and reading on any other device is just too much. I’d love to know why you switched to mirrorless, if you have the time to explain it. I’ve seen this a lot, and was just wondering why a mirrorless camera would be a better choice than a DSLR. As I said, I am thinking of getting a new camera and I’m really keen on knowing what your opinion is. I do everything but the tablet. I find that the Note 4 screen is big enough to act like a mini tablet. And my Dell laptop has an 11 1/2 inch screen, much like a tablet. So I travel minus one geeky stuff. My husband thinks I am too geeky already as it is. My Macbook Air, and my Iphone are both essentials to me. The Macbook Air is brilliant for travelling as it is so lightweight. 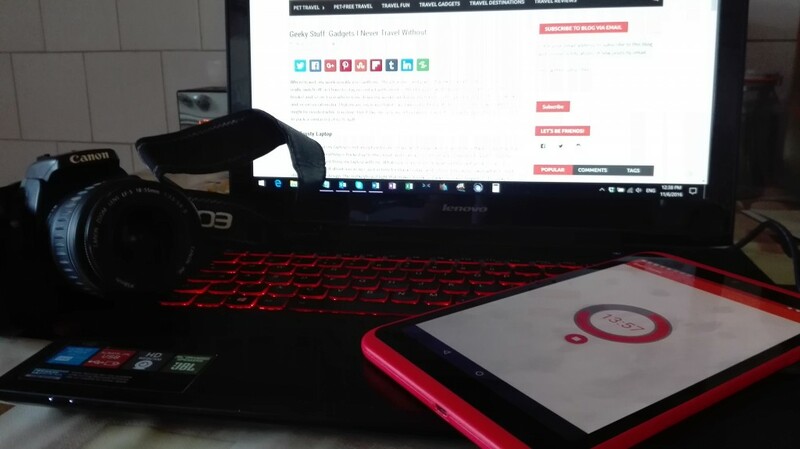 I also use a Lenovo Ideapad and I love it! I’ve always loved Lenovo computers. I travel with all of the above gadgets, too. I use the Sony a6000 for my travel camera which I love love love! You definately carry the essentials! I don’t think I could travel anywhere without my MacBookAir or my Iphone (i’m an apple girl!) – and when I don’t I feel like my arms have been cut off! 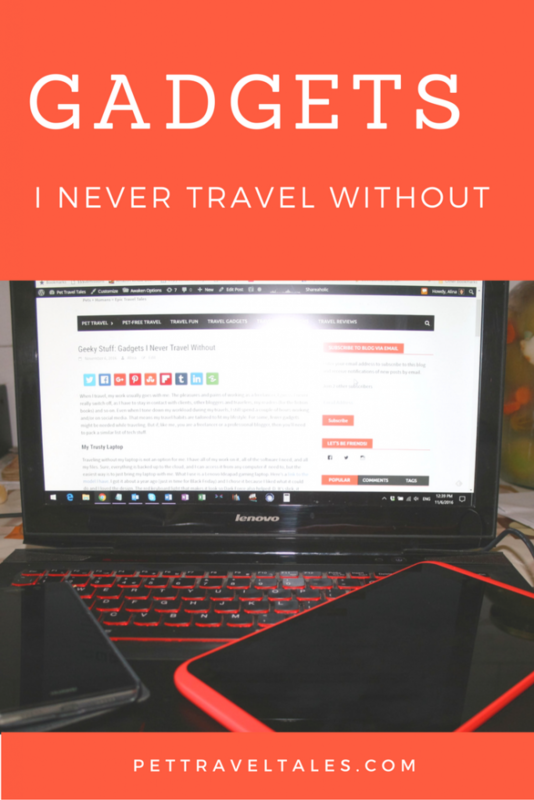 I’m not sure if that makes me too dependent on technology or not… But thats the travel blogger life I suppose! I basically travel with all the stuff you travel with haha! I don;t think I could leave any of my gadgets behind especially my phone. It recently broke on a press trip I was on and I was lost without it! Convenient to do using our laptop.